The Illustrated London News Inside Knowledge. On the right is one of the many big spreadout pages of this magazine. 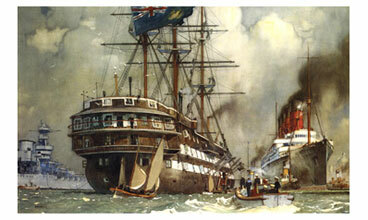 Artist G H Davis was extremely skilful in rendering ship detail and sea waves in a painterly style. He made painting look easy and fun. 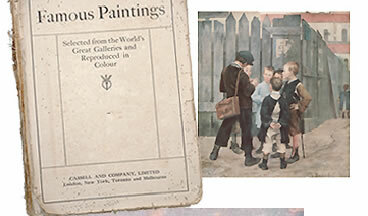 Famous Paintings This big book contains many great paintings in excellent printing quality. A lot of them are lesser known, like this one The Meeting by Marie Bashkirtseff. There are thousands of beautiful paintings of the Victorian period that many of us have seldom or never seen. Claus Bergen His paintings appeared on an early issue of Life magazine. I was fascinated by his technique of sacrifying the entire ship image in order to bring the viewers to maximum closeness to the scene. Stamps I love those beautiful miniature engraved images. Such precision drawing technique makes even mundane subjects look dignified and worth attention. Revell model boxart artists John Steel (ships) and Jack Leynnwood (airplanes). Despite numerous imitations, their boxart paintings are still unsurpassed to this day. Comics Lone Ranger, Batman,Tazan, etc. These comic books taught me line drawing basics and picture composition. Comic artists are very skilful in using shadow and dark areas to show objects' form and their spatial relationship. London Underground map Harry Beck produced this simple, ingenious and informative map in 1933. It has become a symbol to remind me that the primary goal of design is to be functional. There is also a challenge to see if the designer can solve a problem with creative ideas. Illustrative Tourist Guides HC Berann painted many feast-for-the-eyes maps for the travellers. His maps are far more interesting than photographs or satelites images. I still have this map I got when I travelled to Switzerland in 1976. Vintage Poster Art Travel poster artists of the early 20th century are always very imaginative with their picture compositions. I like collecting postcards, posters, labels and books with illustrations of that era. This Pan American Flying Clipper poster by Frank Mackintosh is one of my favourites. Note the exaggerated size of the floatplane, it is so naively effective! Al Hirshfeld used very few but defining lines to capture the features and character of celebrities. The humour he instilled to his drawings is always classy, never vulgar. 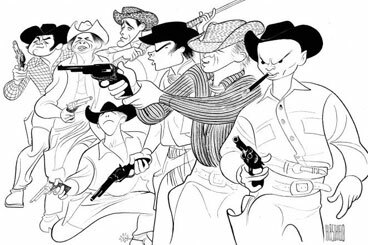 This one he did for the movie The Magnificent Seven (1960) is my favourite. His works are just pen and ink drawings, pretty simple, but they are masterful, elegant, creative, clever, artistic and powerful. 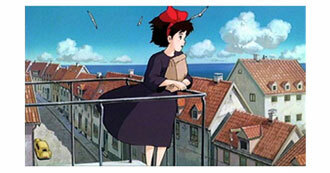 Hayao Miyazaki/Studio Ghibli His hand-drawn animations are far more interesting than the Hollywood CGI counterparts. The scene designs in his animations are so beautiful and dream-like that I want to dive into it every time I watch it. In 2010, I visited the Ghibli Museum in Tokyo. The working sketches and research materials behind his movies are on display there. They are so unbelievably voluminous and meticulous, I feel like an ant. Marine Painters Their work inspired me immensely: Norman Wilkinson, Charles Pears, Claus Bergen, Kenneth Shoesmith and William J Aylward. I love the composition of their paintings; very illustrative yet always is a painting. On the right is Conway and Mauretania in the River Mersey by Kenneth Shoesmith. That composition is amazing. Bravura Realism Painters John Singer Sargent, Joaquin Sorolla, Anders Zorn, Frank Tenney Johnson, Edgar Payne, Frank Brangwyn and Dean Cornwell are all skillful brushstroke painters. I can spend hours on the Internet admiring their work. In 2013, I went to see Anders Zorn's show Sweden's Master Painter at the Legion of Honor in San Francisco. 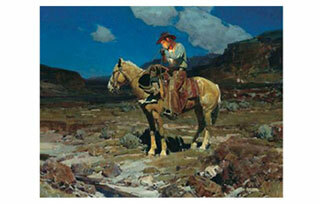 Although Sargent, Sorolla and Zorn are my top favourites, I want to show here a painting by Frank Tenney Johnson Somewhere on the Range. Johnson is my favourite American Western artist. 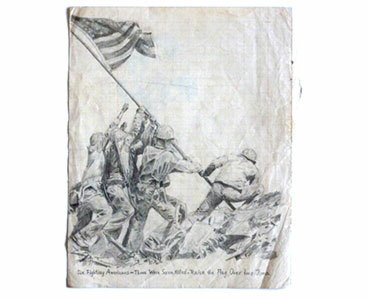 Arts When I was 9 years old, the photo Raising the Flag on Iwo Jima inspired me to make a pencil drawing of it. Today I still find it as one of the greatest photographs of the 20th century. That composition always reminds me of the painting The Raft of the Medusa by Gericault. When I was in high school, I found classical Chinese poems very boring. Today when I pick it up again, I find it a joy to read. Things that are under the domain of creative arts share lots of common disciplines. My knowledge and experience in graphic design and painting taught me how to fully appreciate music, photography, cinema, literature, architecture, product design, fashion, etc. They also inspire and influence my work. As an artist, I am always connected with wonderful things.